Over the past decade, non-invasive pre-clinical imaging has emerged as an important tool to facilitate biomedical discovery. Not only have the markets for these tools accelerated but the numbers of peer reviewed papers in which imaging end points and biomarkers have been used have grown dramatically. High frequency “micro-ultrasound” has steadily evolved in the post genomic era as a rapid, comparatively inexpensive imaging tool for studying normal development and models of human disease in small animals, especially mice. One of the fundamental barriers to this development was the technological hurdle associated with high frequency array transducers. Recently, new approaches have enabled the upper limits of linear and phased arrays to be pushed from about 15 MHz to over 50 MHz enabling a broad range of new applications. This lecture outlines the physical principles of ultrasound with a special focus on high frequency imaging technology used in anatomical, functional and molecular imaging research. Applications are explored in the areas of cardiovascular disease and cancer. The value of microbubble contrast agents and photoacoustic imaging are described and novel directions in contrast imaging are explored. 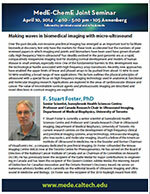 F. Stuart Foster is currently a senior scientist at Sunnybrook Health Sciences Centre and Professor and Canada Research Chair in Ultrasound Imaging, Department of Medical Biophysics, University of Toronto. His current research centres on the development of high frequency clinical and preclinical imaging systems, array technology, intravascular imaging, photoacoustics, and molecular imaging. Stuart is a fellow of the American Institute of Ultrasound in Medicine. He is the founder and former Chairman of VisualSonics Inc., a company dedicated to preclinical imaging. Dr. Foster co-founded the Mouse Imaging Centre (MICe) now at the Toronto Centre for Phenogenomics. He has served on the Board of Directors of the National Cancer Institute of Canada and as Chairman of its Committee on Research (ACOR). He has previously been the recipient of the Eadie Medal for major contributions to engineering in Canada and has been the recipient of the Queen’s Golden Jubilee Medal, the Manning Award of Distinction for Canadian Innovation and the Ontario Premier’s Discovery Award. He serves on numerous advisory bodies and is currently on the editorial boards of Ultrasonic Imaging and Ultrasound in Medicine and Biology. 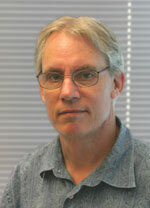 Dr. Foster was the recipient of the 2010 Rayleigh Award from IEEE.